Share "How Often Should I Clean My Pet's Teeth?" In time, untreated dental problems can also lead to heart, liver or kidney disease, conditions that can be fatal to your pet. Fortunately, it is easy to brush your pet's teeth. Use a pet-friendly, enzymatic toothpaste with a flavor that will appeal to your pet – poultry, fish and beef options are popular. Never use human toothpastes on your pet, as they contain chemicals that are toxic to pets if swallowed. Opt for a toothbrush specifically designed for pets, and one that is appropriately sized for your pet's mouth. Keep the experience positive for your pet, and reward their patience and cooperation with praise and comfort so they do not resist brushing. Ideally, you ought to brush your pet's teeth daily to ensure there is no buildup of plaque or tartar that can lead to greater dental problems. Exactly how often your pet needs its teeth brushed can vary, however, and daily brushings may not be easy to arrange if your pet isn't used to the treatment. In general, older dogs will require more frequent brushings, while younger pets can skip a few days without trouble. Smaller dog breeds are also more prone to dental problems and should have their teeth brushed more often, while larger breeds do not always need as much tooth brushing. 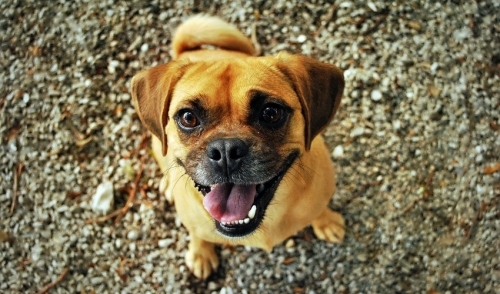 Of course, just as with humans, dogs and cats vary in their individual dental needs. Some animals will have naturally "good" teeth that require less care, while others may have "bad" teeth that need more diligent cleaning. All pets should have their teeth inspected by a dental veterinarian at least once a year. Not only can the vet provide a more thorough cleaning for your pet's teeth, but they will also be able to inspect below the gum line and take X-rays to look for other signs of impending trouble. When that trouble is spotted, earlier treatments will be more successful to protect your pet's teeth. In addition to daily brushings, there are other ways to help keep your pet's teeth clean and ensure good dental health. Feed your pet a nutritious diet for good overall health and resistance to infection, and opt for hard foods that will help keep teeth scrubbed and clean. In cases of severe dental problems, consider foods that have additives to keep plaque soft for easier removal. Provide your pet with adequate chew time using rawhide, rubber balls, Kong toys or similar dental-friendly products that can help scrub teeth. Avoid products that are harder than the animal's teeth, however, or you risk cracked or broken teeth. Always supervise pets when they are allowed to chew on different materials so they do not start chewing on inappropriate items. Ask your veterinarian about oral rinses – mouthwash for pets – and whether or not they would be a good option for your pet's dental concerns. Different products can help with different problems, but use them only under the guidance of your veterinarian. Different pets will have different dental care needs, and by understanding how often to brush your pet's teeth and what other steps to take to help keep their mouth healthy, you can be sure your dog or cat has the best oral hygiene possible.